Get a FREE black ink pad when you order a custom stamp clip/design and stamper. Custom stamps and custom stampers are made to order with personalized polymer/acrylic. 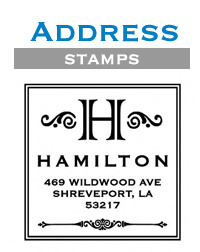 Create personalized stamps with text, date, logos or custom designs at StationeryXpress. 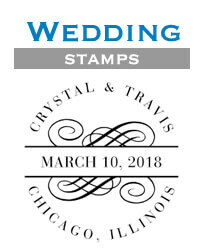 Our personalized stamps give you the option to customize and make each custom stamper uniquely personal and classy. Our self-inking custom stamps last well over 1,000 impressions on a single ink pad. When it comes time to change the ink pad, simply click out the old pad and reinsert a new one. It takes only a couple seconds! Shop for various ink colors here. Our customer stampers are extremely easy to use and even easier to order and will last for years to come. You have the option to order a complete custom stamper set which includes 1 custom clip, 1 stamping device and 1 black ink cartridge. If you already have the stamping device (the stamper), you can order just a customized clip. We also offer pre-designed non-custom clips for a number of different occasions, like "Thank You" clips, "Mr & Mrs" clips and many, many more. View our Mix and Match Stamp Clips here. 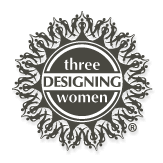 Personalized Stamps from Stationery Xpress are brought to you by the award-winning team at Three Designing Women. Each stamp was thoughtfully designed to be truly unique and special. 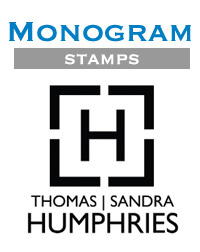 Customized with your text or logo, your personalized stamp will truly be one of a kind. Each personalized stamp is created and customized by you to leave a lasting and meaningful impression that will last a life time. Create the perfect personalized address stamps, monogrammed custom stamps, wedding stamps, greek stamps and even Halloween stamps. There are truly stamps for every occasion. Send a lot of letters? Personalized return address stamps not only save money, but are essential to have on your mail if you'd like the item returned if it proves undeliverable. Customer Stampers make a great gift for almost any occasion. A custom stamp in the form of a gift is something your gift recipient will actually use for years to come and will be truly grateful for. It's thoughtful and shows you took the extra bit of time to make something extra special and unique just for them. Shop now and find a design that works for you. Customize your personalized stamps or custom stampers today at StationeryXpress and please contact us if you have any questions!